Writing from America, a couple of posts ago, I pointed out that the Sporting Gods had enjoyed messing with the boys and I as we sat, somewhat bemused, through four straight Detroit Red Wings losses. Covering six games, including away games, the lengthy losing spell was the worst streak in quite a while for the Wings and was even more bizarre because the team, which bristles with world-class forwards, managed only a measly six goals in those six games. When we arrived at the Verizon Centre in Washington DC, for our first ever Wings sighting on October 22, Detroit was 5-0 after a brilliant start to the 2011-12 NHL season. They lost that match to the Capitals, 7-1. Then lost to the San Jose Sharks, in our first game at the Joe Louis Arena, 2-4. Then lost to the so-so Minnesota Wild, 1-2 (utterly robbed in overtime), and then finally managed to put in an absolute stinker against the Calgary Flames, while we were sitting in dream seats, right on the glass, losing 1-4 and being booed off the ice by the Detroit fans. As mentioned previously, I didn’t actually care that much. It was so much fun to be there and to be watching the team live, that the losses were annoying but not devastating. Yes, I would have loved to have belted out “Don’t stop believin’” but the fact we didn’t just leaves some wriggle room on my Life List. I guess I’ll simply have to somehow return to Detroit and watch some more games … sigh. What’s been truly funny – and I genuinely tip my Red Wings beanie (bought at the Joe) to you, Sporting Gods – has been what’s happened since we packed up and headed for LA and then home. 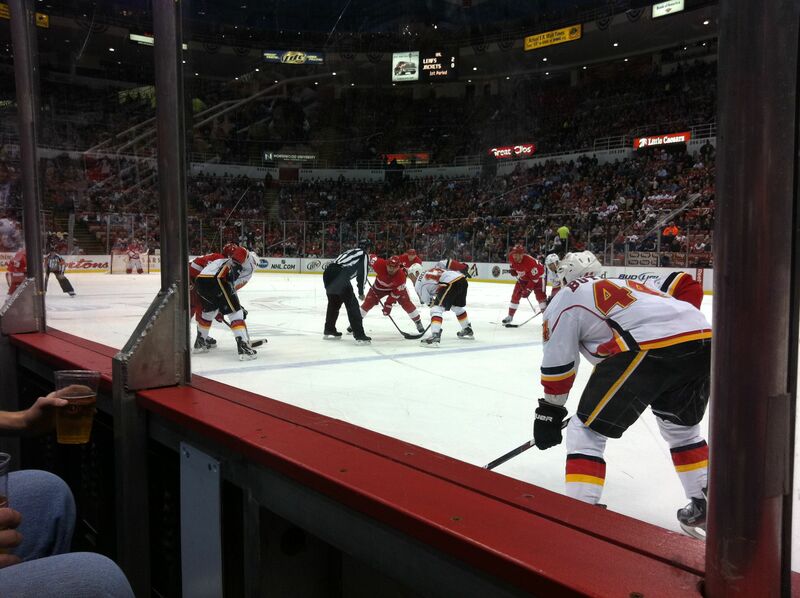 The Wings promptly beat the Anaheim Ducks, 5-0, in the first game after we vacated the Joe. Then backed it up with a 5-2 belting of Colorado. Then beat Edmonton, 3-0, and finally beat Dallas, 5-2, on Sunday. Defender Ian White showed the commitment that has seen the team roar back by diving in front of a Dallas goal-bound puck and stopping it with his unprotected face. One broken cheekbone later, he’s out for maybe seven games, but he protected the lead when it mattered. Full respect. The Wings are back in it, as one of the form and most feared teams of the competition, with some kind of early claims for Stanley Cup contention. Me? I’ll do my bit and bunker down in Melbourne, a long long way away, working on my pivots and other moves, trying to improve my on-ice balance and waving flags that I am no longer on-site at the Joe. As long as Will, Mack and I don’t go anywhere near the Wings, they’ll be fine. « I’ve made a huge mistake.